I know what you’re thinking. There is no way this girl is about to tell me I can eat pizza. Well I was determined to find a way to eat a healthier pizza. When I have a craving nothing will stop me from eating it. 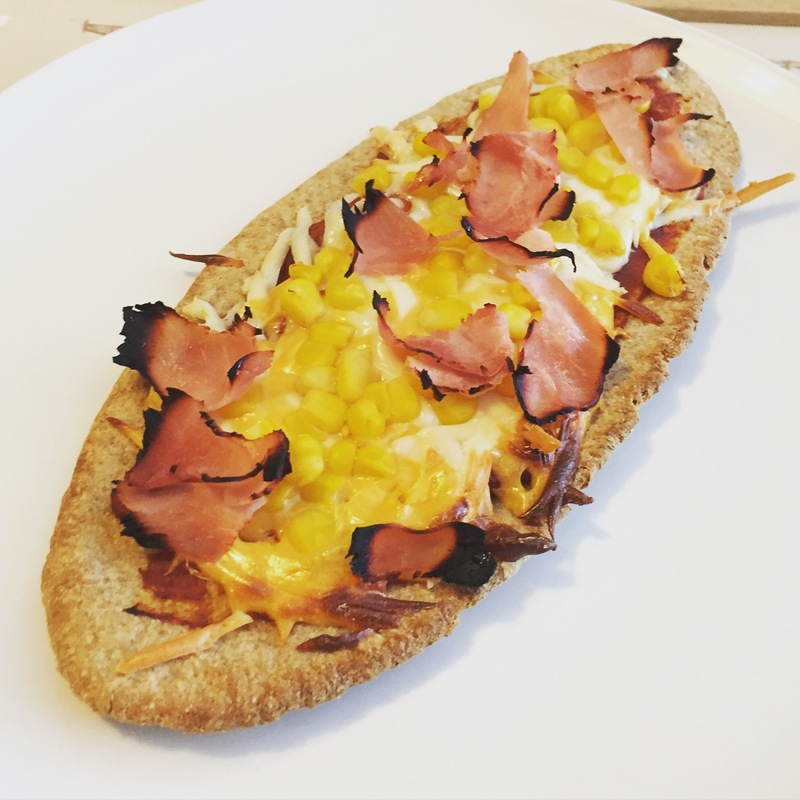 Obviously a dominos couldn’t be had (even though I really miss their beautiful gooey cookies) but I did find a healthier version of a good old pizza. First of all, the pizza base. When I was younger I was bought up on pitta bread pizzas, and I really have no idea if they were common or not.. But I sure love them. I searched the shelves for wholemeal pitta bread (but white would still work as long as it’s still low fat). Wholemeal bread is lower GI so more diabetes friendly! But what on earth would I do about the cheese? I’m sure every dieter out there is aware of the high fat content in cheese. Even reduced far cheese is still high in saturated fats. So the toppings were my next issue. I’m sorry everybody but pepperoni isn’t healthy. But you can easily find ham or roast beef in supermarkets with the nutritional information on the front showing how low in fat they are – especially compared to pepperoni. Now if you really need to treat yourself to pepperoni then so be it, just don’t tell anyone! Create your pizza with pitta bread, tomato Passata, 30g cheese and your toppings. Bake in the oven for 12-15 minutes at 180 degrees Celsius. And if you’re a vegetarian just don’t add any meat toppings! A perfect pizza every time! You can actually avoid a lot of saturated fat by avoiding meat sometimes. I’m not saying become a vegetarian, but why not have one meat-free day per week? This little vegetarian treat was a hit when I cooked it for myself and my vegetarian friend. She had it with about four papadums, whereas I had one. 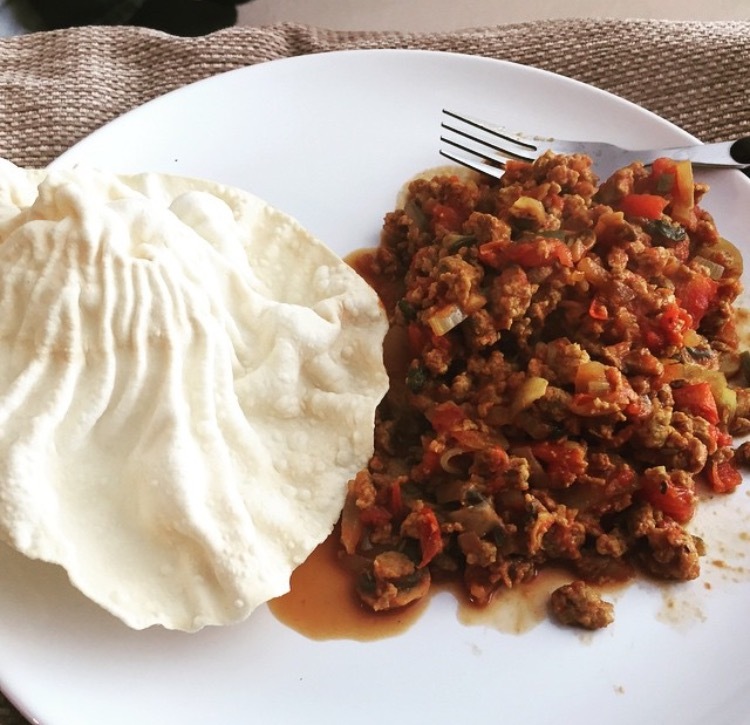 Papadums aren’t the healthiest, but if you buy raw ones from the supermarket and pop them in the microwave for 10-20 seconds they look absolutely amazing, taste great and have none of the fats involved in deep frying in oil. This is what I mean by raw papadums. So here is a very useful recipe from diabetes.co.uk which you can view here. Pour the vegetable oil into a frying pan, and place the pan over a medium heat. Once the oil’s hot, add the onions and fry until they’re brown, stirring throughout. This should take around 4 minutes. Whizz the tomatoes in a food processor. Throw in the garlic and ginger, then cook for another minute. Mix in the tomatoes and chilli. Stir in the coriander, cumin and turmeric. Place the vegetarian mince and the mushrooms into the mixture and cook for 5 minutes. Pour 80ml of water into the mixture and simmer for 3 minutes. Your dish is now ready to serve. I recommend serving this dish with some brown rice or, as I did, a papadum if you’re feeling slightly less hungry (ha!). 100g cooked brown rice is a (slightly) small amount but is what you should aim for if you’re dieting, but given the low calorie and fat content in the keema you can get away with some extra rice in the dish. When following this recipe it is MUCH easier when you actually are cooking for four. 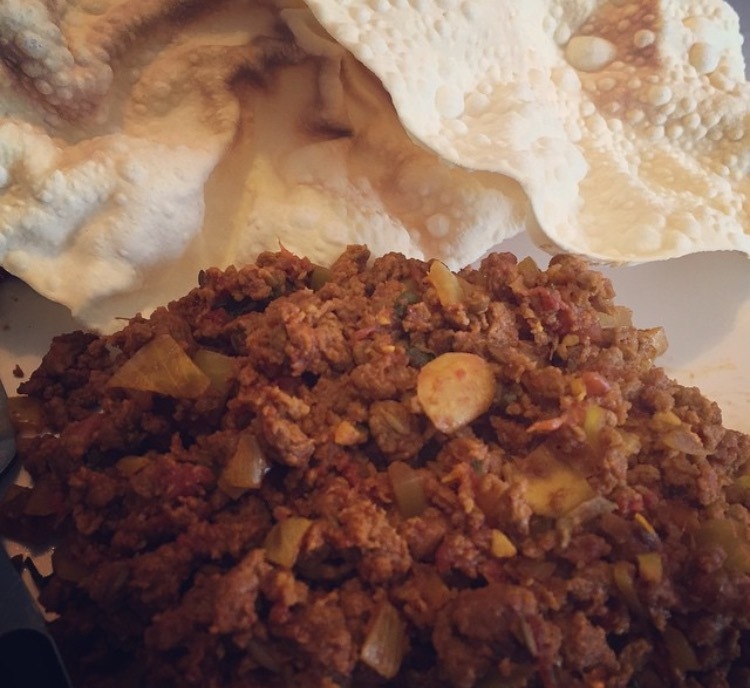 When I was cooking for two I had to halve the ingredients and, somehow, got a little muddled so ended up adding water to the keema (hence the leaky water in picture two – it won’t happen to you if you follow the recipe).